The Kuhl Burr™ Vest is made with rugged, soft cotton canvas that’s ready for anything. Lined in micro fleece vest for warmth, the Kuhl Burr™ Vest is built with an eye towards timeless style and ultimate versatility. Based on the now classic Kuhl Burr™ Jacket, the vest makes a great layering piece for shoulder season (late spring, early fall) and cool summer nights. You can also use The Kuhl Burr™ Vest in the winter to add versatile temperature regulation to your wardrobe. With generous hand pockets able to hold your gear, saddle stitching to reduce the bulk of the garment, and a zippered chest pocket, this may become an essential favorite for your fishing and hunting trips, camping expeditions, and day hikes. 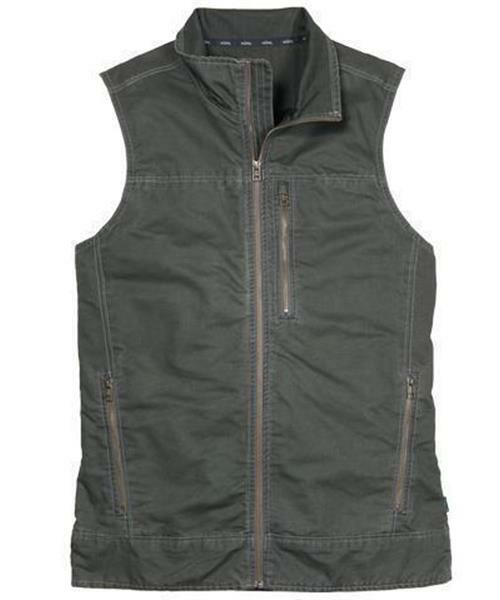 Burr Vest - Mens is rated 5.0 out of 5 by 2. Rated 5 out of 5 by Northern Piper from Rugged Vest with Great Style and Athletic Fit This is a rugged vest with great style and an ahletic fit. The workmanship and materials are top notch and it is durable. I used it in wet snow working against scratchy branches and the vest beaded the water and appeared unscathed. It also kept me warmer than I thought it would. There are lot's of pockets, though the hand pockets are a little shallow, but still work. This is a more athletic cut, which is a great option for those looking for it; I am 5'8" and an athletic 162 lbs and M fits perfectly. Highly recommended! Rated 5 out of 5 by Daveo from Exactly what I was looking for! I wanted a product made of heavy cotton or canvas not nylon so it would be more durable. The pockets are zippered and very secure one external on the upper left and one inner on the upper right as well as two lower on each side. The collar also adds a bit of style to the overall appearance. Very happy as I have been looking for this best for a long time!